There are many Rings, but only one Bayreuth. 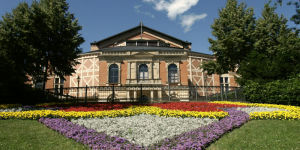 It is the ultimate Wagner experience, to hear the Maestro’s music, in his city, in his opera house. The Bayreuth Festival has it all: pomp and pageantry, fanfare and feuding, musical epiphanies, production-related outrages, political clashes, foot-stamping approval and the occasional chorus of boos. It is evocative, exhilarating, all-consuming and unlike any other musical experience anywhere. You have likely heard tell of the bottom breaking wooden benches, of the lack of air-conditioning, of the hour-long intervals that make for seven-hour marathons at the Festspielhaus… but unless you have experienced it, you have not heard this music played live with such sublime perfection. Flights are not included in tour pricing. Flights should be booked to arrive in Frankfurt, Munich or Nuremberg late morning/early afternoon on the first day of the tour, with departure from one of those cities on the departure day. We provide airport/rail station—hotel transfers for arrivals and departures within an hour’s drive of our first/last hotel, and within 3 days of the start/end of our tour. There is minimal walking with some stairs and cobblestones during the guided tours. As for all of our tours, we are happy to accommodate you regardless of your mobility level. Please make clear your mobility concerns at the time of registration. We provide transfers for group meals and performances that are beyond a 10 minute walk. Expect long days at the opera (7 hours, including intervals, for the longer operas, with hard bench seats and no air-conditioning).